Bit Tooth Energy: Deepwater Oil Spill - how to deal with a dead well? Deepwater Oil Spill - how to deal with a dead well? The Admiral confirmed, in his Friday press conference, that the negative pressure test on the Deepwater well held steady for 24-hours without any inflow of fluid into the well, or increase in pressure. That means that there is sufficient cement in the annulus to block a free passage from the reservoir, through the annulus, to the well head. In other words the well is killed. The problem now becomes something different. As I mentioned yesterday the central section of the well, inside the production casing, is full of cement. The only path possibly available is up the annulus, above the bottom section where cement has filled it. The problem that is now faced is that no-one knows how much of the cement in the annulus was there from the original cementing of the production casing into place, and how much from the injection of cement during the static kill. If it is a relatively small amount, then there is a risk that this barrier may fail, with time, and oil under reservoir pressure can then flow up the annulus to the well head. And to help with the discussion, here is the picture that I have used before to illustrate the situation. I would suspect that it is a relatively thick barrier – the original injection of cement into the well from the production casing was, if my memory serves, about half that required to fill the annulus to the previous cement lining injection. Given that this is 800 ft above the bottom of the well, then there is 400 ft of cement above the shoe in the annulus. In a relatively close to surface operation, the flow of fluid across the bottom of that column might induce enough cavitation to eat back the cement by about 20-ft or more (Glen Canyon Dam, and Tarbela High Dam for eg) but with the back pressures in the well that would suppress cavitation, I don’t anticipate that there was that much erosion out of the flow path of the oil and gas to the bottom of the well. There could be enough erosion along the contact with the overlying sandstone, which would erode out the column over the height of the sandstone, (say 60 ft) but even with that there is likely at least a couple of hundred feet of cement in the annulus above the reservoir creating a seal. But that leaves the problem of the up to 1,000 barrels of oil that may be trapped in the annulus, begging the question as to how it is supposed to have got there if the cement in the annulus retained its integrity above the reservoir. 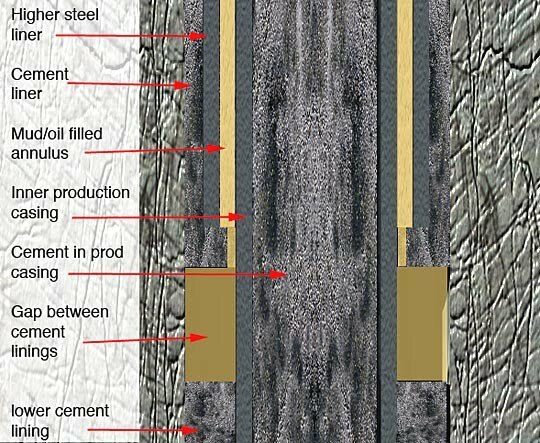 To determine if that is oil, which would imply that the above supposition was wrong and that the well had no cement integrity in the annulus until the cement from the static kill provided some, the relief well has to intersect the original well. When it does so it raises two problems, only one of which I mentioned in the last post. The one I mentioned is that with a cement plug in the annulus below the intersection if BP start to inject fluid into the annulus they don’t have an easy way of displacing the fluid already there. There is nowhere to push it, and no clear way to circulate it out with the relief well configuration. The logical path to push it upwards out of the well runs into a slight problem that the Admiral introduced today, which is that the part between the new stack and the old BOP (the spooling tool) is only rated to 7,500 psi. And there is no simple path for fluid to flow from the annulus up through the existing hardware on top of the rig into a pipe that could carry it to a vessel at the surface. 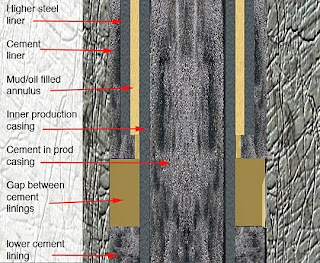 The one that I did not mention was that if the original cement has been removed over the full column of the annulus down at the bottom of the well, and only replaced by the cement injected during the static kill, then there is no way of knowing how thick that barrier is. Raising the pressure in the annulus to inject cement into it from the relief well could break that barrier (though it would also provide a path for oil in the well to displace downwards back into the reservoir and thus dispose of maybe 10% of the oil in the annulus., which still leaves the question as to how to displace the rest. On the other hand if the relief well goes into the annulus and finds nothing but mud (from the pre-cement days when the production casing was installed) then the question becomes moot. There seems to be an underlying assumption that the original cement sheath in the annulus is competent and that it is "a relatively thick barrier". That may be a bad assumption. Remember the fluid flow model studies Halliburton did before recommending the 20 centralizers? Without all those centralizers, the pipe would be slightly off center and there were predicted to be channels in the cement. We can thank the cost-shaving organization for which former CEO Tony Hayward has yet to pay the full price, but BP went with the 6 centralizers in hand. Probably, the cement sheath has channels through it. If the cement in the annulus is a couple of hundred feet long, the question becomes as to whether any channels that were formed during installation are continuous throughout the layer. My point is that if they weren't there during installation and formed the primary flow path for the oil (the initial theory now shown wrong by the cement path) its hard to see how flow in another direction could erode out such a passage.